Aquatic plants are plants that start their lives in water and continue to grow in water for at least a portion of their lives. Because they live in water they grow faster than plants planted in soil. Plants grown in water have a high water density and are more buoyant, as they don’t have to invest as much resources for supporting tissues as terrestrial plants do. They also play an important role in lake ecology. Cattails, one of the most common aquatic plants, are so-named because they have brown flowers spikes that resemble a cat’s tail. These spikes are more than a foot long. They serve as a shelter for water birds and other animals living near water. Cattails have fleshy extensive rhizomes and stiff leaf blades. Flowers, which are inside the plant's floral head, are not easily seen. These aquatic plants are found throughout the United States and southern Canada and also grow in temperate areas of Europe and Asia. Water lilies are considered as jewels of a pond by many people. They range in shapes and sizes from miniature blooms to huge flowers more than 25 square feet wide, according to ExoticWaterscapes.com. Besides being attractive, they help a pond’s ecosystem. These aquatic plants spread across the surface of water’s surface, giving color and providing safety for a pond and its creatures. They keep water temperatures down by providing shade during hot summers and block out much sunlight. Controlling algae growth is another important role of water lilies. Water lilies grab nutrients from the water that undesirable plants would have received. This helps keep water clear and clean. The water lotus, which is related to the water lily, is an exotic aquatic plant that gives a dramatic look to a water garden. These plants thrive in sunlight. A water lotus plant spreads across a pond and can appear overwhelming in smaller ponds. Water lotuses come in several different varieties and sizes. While smaller varieties are 6 to 8 feet long, larger types can grow as tall as 18 to 20 feet long, according to PondKoi.com. Water lettuce, a free-floating plant, has dusty green leaves covered with exceptionally fine hair arranged in a spiral pattern from the plant’s center. Flowers are inconspicuous. This aquatic plant needs to be controlled because it’s an aggressive invader and able to form floating dense mats that cover a pond’s entire surface which causes a reduction in oxygen. Fish are killed as a result. 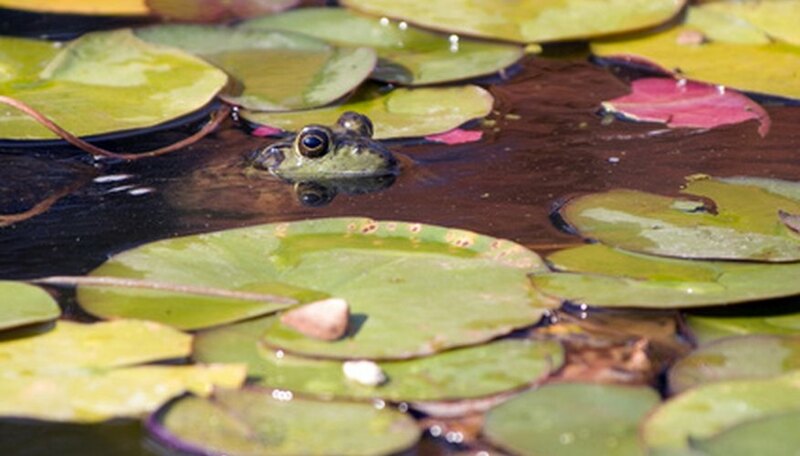 Because water lettuce plants don't even supply food to wildlife, they're considered pests.